Power ultrasound in molten metals and alloys shows various beneficial effects such as structuring, degassing, and improved filtration. Ultrasonic promotes the non-dendritic solidification in liquid and semi-solid metals. Sonication has significant benefits on the microstructural refinement of dendritic grains and primary intermetallic particles. Furthermore, power ultrasound can be used purposefully to reduce the metal porosity or to produce meso-porous structures. Last but not least, power ultrasound improves the quality of castings. Ultrasonic treatment can obviously change the solidification microstructure of stainless steel, after the introduction of ultrasound into the molten steel, the solidification microstructure changes from dendrites to equi-axed grains, as illustrated in the microstructures under 150 W, 200 W and 300 W.
It can be observed that there is severe attenuation of ultrasound in the molten metal, for example, when the power is 150 W, the microstructure of the samples from horn is fine-grained equi-axed structure, coarse-grained equi-axed structure and short dendrites respectively. As position 1 is the nearest to the booster, the effect of ultrasonic treatment is the strongest, the sample at position 1 has the smallest average grain size; when the ultrasound arrives at position 2, the power is not so strong as that in position 1 due to the attenuation, and the average size of the equi-axed structure becomes larger; at position 3, where the effect of ultrasound is greatly reduced, the microstructure of sample is mainly short dendrite. The effect of ultrasonic treatment increases with the rise of power, for example, at position 2, some equi-axed structures are choosed randomly in different samples and the average size is calculated, it is revealed that the average size of equi-axed structure is about 160 μm, 120 μm, 100 μm under the ultrasonic power of 150 W, 200 W, 300 W respectively. Ultrasonic treatment has come into wide use in many fields since the application in medicine at the beginning of last century. In the field of foundry, ultrasonic treatment can refine the microstructure and reduce segregation of the metals and alloys.1,2,3,4,5,6,7,8,9,10,11) The microstructure formed during the solidification has a direct impact on the properties of metal materials, refining the metal microstructure during solidification can evidently improve the mechanical properties of metal materials, which will satisfy the performance requirement that conventional casting cannot meet. 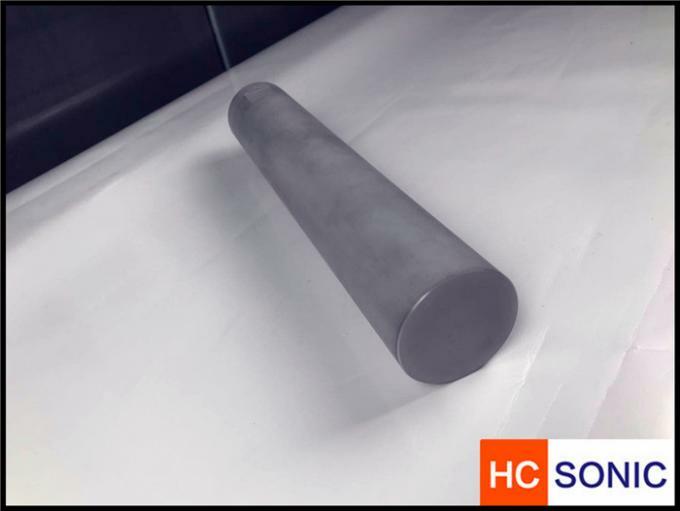 Nowadays, the application of ultrasonic treatment on metal solidification is becoming more and more common, and substantive research results have been achieved about refining the solidification microstructure. Osawa et al.12) applied ultrasonic treatment in the solidification of AZ91 alloy, as a result, fine and uniform microstructure was obtained, meanwhile, the yield strength and tensile strength were both improved significantly as well; Atamanenko et al.13) carried out experiments to investigate the process of aluminum melt treatment using ultrasound, and determined the effect of cooling temperature on the refinement of microstructure during solidification. However, the melt with high temperature would corrode the booster which plays a very important role in introducing ultrasound into molten metal, for this sake, the research of refining microstructure with ultrasound mainly focused on low-melting-point metal,14,15,16,17,18,19,20) there is relatively less research about the effect of ultrasonic treatment on the high-melting-point metals, such as steels. Liu et al.21) treated T10 steel by using ultrasound introduced from the lateral, and studied the solidification microstructure, segregation, mechanical properties, and anticorrosion property under different powers. 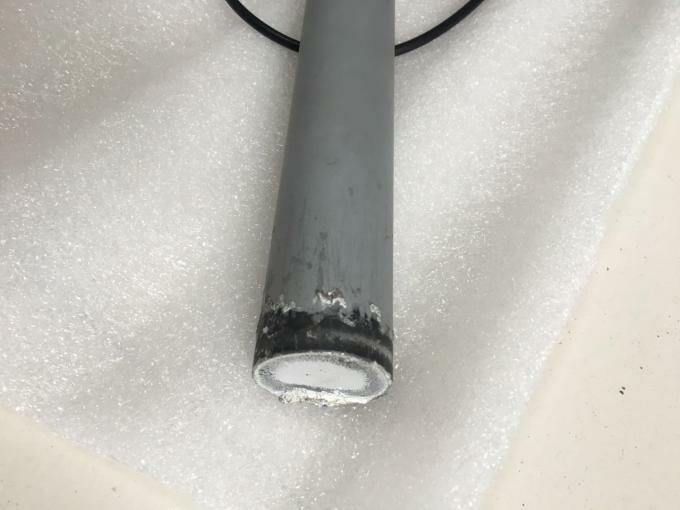 Although this method avoided corrosion of the booster, the loss of energy was still considerable, leading to low efficiency of ultrasonic application. Li et al.22) have done research on the material properties of the booster, and concluded that Mo–Al2O3–ZrO2 ceramic metal tube which could endure corrosion at high temperature and high- frequency vibration was fitful for introducing ultrasound into steels. But, that method faces the difficulty of processing metal ceramic tube. An innovative method for introducing ultrasound into the melt is proposed in this paper, the metal to be treated and the booster which is placed upward in the experiment are processed as an unit piece, and the metal is melt by induction coils while ultrasonic vibration is introduced from the bottom of molten metal directly, avoiding erosion and power attenuation to the maximum extent. The refinement of solidification microstructure, the fragmentation of inclusions and the improvement of the mechanical property of 304 stainless steel are researched based on this newly proposed method. With the typical structure, for example, ultrasonic launch metallic melts the processor is a round bar. After the molten metal, just insert the firing head metal melt, can emit ultrasonic to metallic melts. Vibration system enclosure front flange used for fixation. Due to the ultrasonic vibration system has no moving parts and mechanical parts, the fixed no special requirements. Treated melt in a specific container, such as crucible furnace, crystal furnace. Tool head inserted into the melt, the side of launch ultrasonic wave. In general, it is suggested that in the melt cools down to join ultrasound, to melt in the cooling crystallization was also strong ultrasonic effect. Treated melt quantity may be less more. For specific melt treated the less amount of melt, the output power of ultrasonic generator, ultrasonic action, the longer the ultrasonic synthesis strength is high. Similarly, we also can by controlling the amount of melt, the size of the ultrasonic generator output power, and the ultrasonic action time, to control the intensity of the ultrasonic function. Due to the characteristics of all kinds of metal materials and different requirements, the function and effect of ultrasound is also each are not identical. In view of the performance requirements of the particular metal users, only through trial and error for many times, find the best balance of ultrasound intensity and actual effect, thus, the best processing technology. 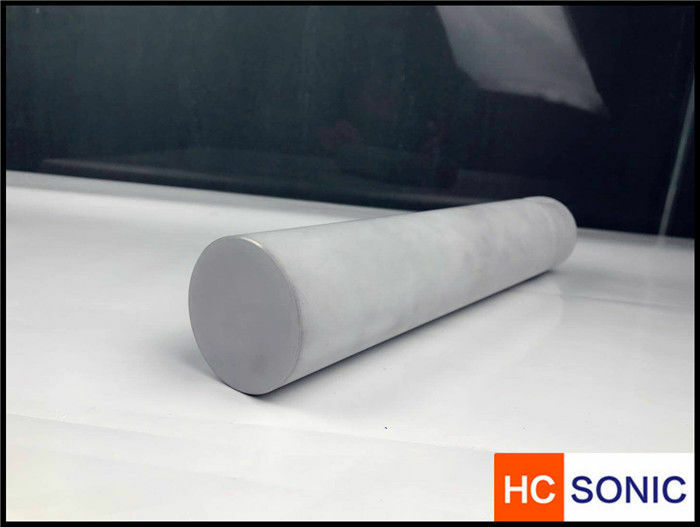 High power ultrasonic effect on the crystallization of molten metal process, can significantly refine metal grain, homogeneous alloy composition, accelerate the bubble moion, significantly improve the metal material properties, such as strength, hardness, plasticity and toughness.